Nearly everything we understand about global warming was understood in 1979. It was, if anything, better understood. Today, almost nine out of ten Americans do not know that scientists agree, well beyond the threshold of consensus, that human beings have altered the global climate through the indiscriminate burning of fossil fuels. But by 1979 the main points were already settled beyond debate, and attention turned from basic principles to a refinement of the predicted consequences. Unlike string theory and genetic engineering, the “greenhouse effect”—a metaphor dating to the early 20th century—was ancient history, described in any intro-to-biology textbook. The basic science was not especially complicated. It could be reduced to a simple axiom: the more carbon dioxide in the atmosphere, the warmer the planet. And every year, by burning coal, oil, and gas, human beings belched increasingly obscene quantities of carbon dioxide into the atmosphere. The world has warmed more than 1 degree Celsius since the Industrial Revolution. The Paris climate agreement—the nonbinding, unenforceable, and already unheeded treaty signed on Earth Day 2016—hoped to restrict warming to 2 degrees Celsius. A recent study puts the odds of pulling this off at 1 in 20. If by some miracle we succeed, we will only have to negotiate the extinction of the world’s tropical reefs, a sea level rise of several meters, and the abandonment of the Persian Gulf. The climate scientist James Hansen has called a 2-degree warming “a prescription for long-term disaster.” Long-term disaster is now the best-case scenario. A 3-degree warming, on the other hand, is a prescription for short-term disaster: forests sprouting in the Arctic, the abandonment of most coastal cities, mass starvation. Robert Watson, a former chairman of the United Nations Intergovernmental Panel on Climate Change, has argued that a 3-degree warming is the realistic minimum. Four degrees: Europe in permanent drought; vast areas of China, India, and Bangladesh claimed by desert; Polynesia swallowed by the sea; the Colorado River thinned to a trickle. The prospect of a 5-degree warming prompts some of the world’s preeminent climate scientists, not an especially excitable type, to warn of the fall of human civilization. The proximate cause will be not the warming itself—we won’t burst in flame and crumble all to ashes—but its secondary effects. The Red Cross estimates that already more refugees flee environmental crises than violent conflict. Starvation, drought, the inundation of the coasts, and the smothering expansion of deserts will force hundreds of millions of people to run for their lives. The mass migrations will stagger delicate regional truces, hastening battles over natural resources, acts of terrorism, and declarations of war. Beyond a certain point, the two great existential threats to our civilization, global warming and nuclear weapons, will loose their chains and join to rebel against their creators. If an eventual 5- or 6-degree warming scenario seems outlandish, it is only because we assume that we’ll respond in time. We’ll have decades to eliminate carbon emissions, after all, before we are locked into 6 degrees. But we’ve already had decades—decades increasingly punctuated by climate-related disaster—and we’ve done nearly everything possible to make the problem worse. It no longer seems rational to assume that humanity, encountering an existential threat, will behave rationally. The conditions for success were so favorable that they have the quality of a fable, especially at a time when so many of the veteran members of the climate class . . . openly despair about the possibility of achieving even mitigatory success. So what happened? The common explanation today concerns the depredations of the fossil fuel industry, which in recent decades has committed to playing the role of villain with comic-book bravado. Between 2000 and 2016, the industry spent more than $2 billion, or ten times as much as was spent by environmental groups, to defeat climate change legislation. A robust subfield of climate literature has chronicled the machinations of industry lobbyists, the corruption of pliant scientists, and the influence campaigns that even now continue to debase the political debate, long after the largest oil and gas companies have abandoned the dumb show of denialism. But the industry’s assault did not begin in force until the end of the 1980s. During the preceding decade, some of the largest oil and gas companies, including Exxon and Shell, made serious efforts to understand the scope of the crisis and grapple with possible solutions. We despair today at the politicization of the climate issue, which is a polite way of describing the Republican Party’s stubborn commitment to denialism. In 2018, only 42 percent of registered Republicans knew that “most scientists believe global warming is occurring,” and that percentage has fallen. Skepticism about the scientific consensus on global warming—and with it, skepticism about the integrity of the experimental method and the pursuit of objective truth—has become a fundamental party creed. But during the 1980s, many prominent Republican members of Congress, cabinet officials, and strategists shared with Democrats the conviction that the climate problem was the rare political winner: nonpartisan and of the highest possible stakes. Among those who called for urgent, immediate, and far-reaching climate policy: Senators John Chafee, Robert Stafford, and David Durenberger; Environmental Protection Agency administrator William K. Reilly; and, during his campaign for president, George H. W. Bush. As Malcolm Forbes Baldwin, the acting chairman of Ronald Reagan’s Council for Environmental Quality, told industry executives in 1981, “There can be no more important or conservative concern than the protection of the globe itself.” The issue was unimpeachable, like support for the military and freedom of speech. Except the atmosphere had an even broader constituency, composed of every human being on Earth. It was widely accepted that action would have to come immediately. At the beginning of the 1980s, scientists within the federal government predicted that conclusive evidence of warming would appear on the global temperature record by the end of the decade, at which point it would be too late to avoid disaster. The United States was, at the time, the world’s dominant producer of greenhouse gases; more than 30 percent of the human population lacked access to electricity altogether. Billions of people would not need to attain the “American way of life” in order to increase global carbon emissions catastrophically; a light bulb in every other village would do it. A 1980 report prepared at the request of the White House by the National Academy of Sciences proposed that “the carbon dioxide issue should appear on the international agenda in a context that will maximize cooperation and consensus-building and minimize political manipulation, controversy and division.” If the United States had endorsed the proposal broadly supported at the end of the 1980s—a freezing of carbon emissions, with a reduction of 20 percent by 2005—warming could have been held to less than 1.5 degrees. A broad international consensus had agreed on a mechanism to achieve this: a binding global treaty. The idea began to coalesce as early as February 1979, at the first World Climate Conference in Geneva, when scientists from 50 nations agreed unanimously that it was “urgently necessary” to act. Four months later, at the Group of Seven meeting in Tokyo, the leaders of the world’s wealthiest nations signed a statement resolving to reduce carbon emissions. A decade later, the first major diplomatic meeting to approve a framework for a treaty was called in the Netherlands. Delegates from more than 60 nations attended. Among scientists and world leaders, the sentiment was unanimous: action had to be taken, and the United States would need to lead. It didn’t. The inaugural chapter of the climate change saga is over. In that chapter—call it Apprehension—we identified the threat and its consequences. We debated the measures required to keep the planet within the realm of human habitability: a transition from fossil fuel combustion to renewable and nuclear energy, wiser agricultural practices, reforestation, carbon taxes. We spoke, with increasing urgency and self-delusion, of the prospect of triumphing against long odds. We did not, however, seriously consider the prospect of failure. We understood what failure would mean for coastlines, agricultural yield, mean temperatures, immigration patterns, and the world economy. But we did not allow ourselves to comprehend what failure might mean for us. How will it change the way we see ourselves, how we remember the past, how we imagine the future? How have our failures to this point changed us already? Why did we do this to ourselves? These questions will be the subject of climate change’s second chapter. Call it the Reckoning. That we came so close, as a civilization, to breaking our suicide pact with fossil fuels can be credited to the efforts of a handful of people—scientists from more than a dozen disciplines, political appointees, members of Congress, economists, philosophers, and anonymous bureaucrats. They were led by a hyperkinetic lobbyist and a guileless atmospheric physicist who, at severe personal cost, tried to warn humanity of what was coming. They risked their careers in a painful, escalating campaign to solve the problem, first in scientific reports, later through conventional avenues of political persuasion, and finally with a strategy of public shaming. Their efforts were shrewd, passionate, robust. And they failed. What follows is their story, and ours. It is flattering to assume that, given the opportunity to begin again, we would act differently—or act at all. You would think that reasonable minds negotiating in good faith, after a thorough consideration of the science, and a candid appraisal of the social, economic, ecological, and moral ramifications of planetary asphyxiation, might agree on a course of action. You would think, in other words, that if we had a blank slate—if we could magically subtract the political toxicity and corporate agitprop—you’d think we’d be able to solve this. Yet we did have something close to a blank slate in the spring of 1979. President Jimmy Carter, who had installed solar panels on the roof of the White House and had an approval rating of 46 percent, hosted the signing of the Israel-Egypt peace treaty. “We have won, at last, the first step of peace,” he said. “A first step on a long and difficult road.” The number one film in America was The China Syndrome; the number one song was the Bee Gees’ “Tragedy.” Barbara Tuchman’s A Distant Mirror, a history of the calamities that befell medieval Europe after a major climatic change, had been near the top of the bestseller list all year. An oil well off Mexico’s Gulf Coast exploded and would gush for nine months, staining beaches as far away as Galveston, Texas. In Londonderry Township, Pennsylvania, at the Three Mile Island nuclear plant, a water filter was beginning to fail. And in the Washington, D.C., headquarters of Friends of the Earth, a 30-year-old activist, a self-styled “lobbyist for the environment,” was struggling through a dense government report, when his life changed. 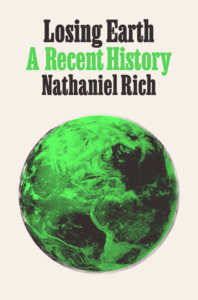 Excerpted from Losing Earth: A Recent History by Nathaniel Rich. Published by MCD, an imprint of Farrar, Straus and Giroux April 9th 2019. Copyright © 2019 by Nathaniel Rich. All rights reserved. Nathaniel Rich is the author of the novels Odds Against Tomorrow and The Mayor’s Tongue. 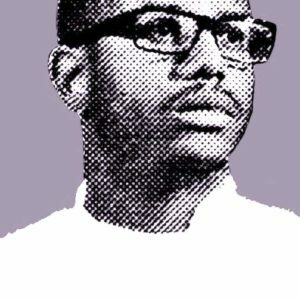 His short fiction has appeared in McSweeney’s, The Virginia Quarterly Review, and VICE, among other publications. He is a writer at large for the New York Times Magazine and a regular contributor to the New York Review of Books and the Atlantic. Rich lives in New Orleans.